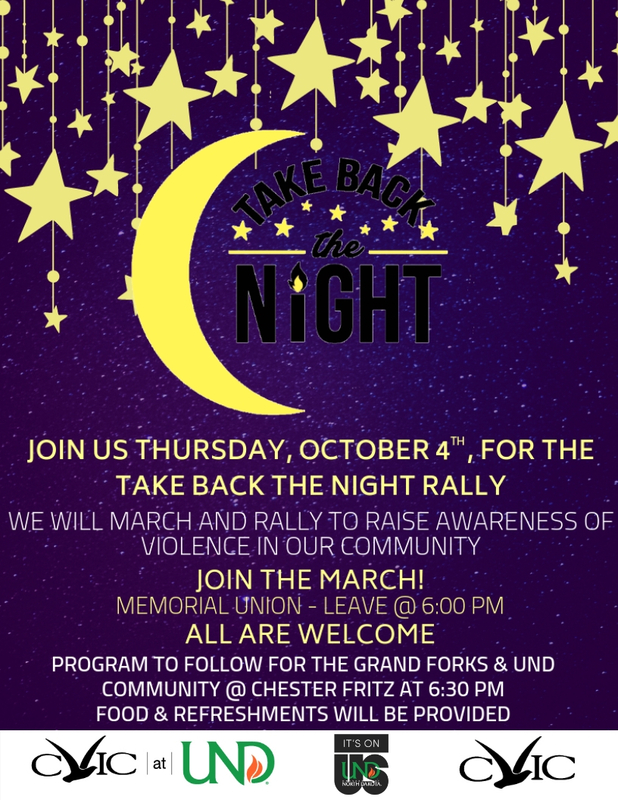 The annual Take Back the Night March and Rally will be held Thursday, Oct. 4, from 6 to 8:30 p.m. to raise awareness of violence in our community. The march will start at the Memorial Union at 6:00 p.m. and end at the Chester Fritz Auditorium. Food and program to follow at the Chester Fritz Auditorium. UND and CVIC have partnered for the annual rally. Take Back the Night is worldwide foundation whose mission is to create safe communities and respectful relationships through awareness event initiatives seeking to end sexual assault, domestic violence, dating violence, sexual abuse, and all other forms of sexual violence.